What makes an attractive smile? Of course, shiny, straight and defect-free teeth are a big factor. But there’s another equally important element: all your teeth have come in. 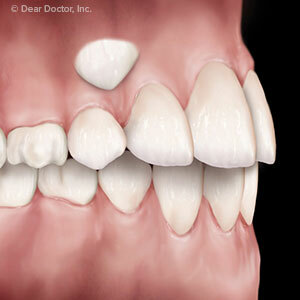 Sometimes, though, they don’t: one or more teeth may remain up in the gums, a condition known as impaction. And if they’re in the front like the upper canines (the pointed teeth on either side of the front four incisors) your smile’s natural balance and symmetry can suffer. Impaction usually happens due to lack of space on a small jaw. Previously erupted teeth crowd into the space of teeth yet to come in, preventing them from doing so. As a result the latter remain hidden within the gums. While impaction can interfere with the smile appearance, it can cause health problems too. Impacted teeth are at higher risk for abscesses (localized areas of infection) and can damage the roots of other teeth they may be pressing against. That’s why it’s desirable for both form and function to treat them. We begin first with an orthodontic examination to fully assess the situation. At some point we’ll want to pinpoint the impacted teeth’s precise location and position. While x-rays are useful for locating impacted teeth, many specialists use cone beam CT (CBCT) technology that produces highly detailed three-dimensional images viewable from different vantage points. If the tooth is in too extreme a position, it might be best to remove it and later replace it with a dental impact or similar restoration once we’ve completed other necessary orthodontic treatment. But if the tooth is in a reasonable position, we might be able to “move” the tooth into its proper place in the jaw in coordination with these other tooth-movement efforts to make room for it. To begin this process, an oral surgeon or periodontist surgically exposes the tooth crown (the normally visible portion) through the gums. They then bond a small bracket to the crown and attach a small gold chain. An orthodontist will attach the other end to orthodontic hardware that will exert downward pressure on the tooth to gradually bring it into normal position. Dealing with impacted teeth of this nature is often part of a comprehensive effort to correct the bite. If we’re successful, it could permanently transform both the smile and overall dental health.